Like I said before - try it. I know which horse my money is on. There is a great deal of presumption going on regarding the formal voltage specifications for the RPi - and I can't find any. So why did you presume 5V1? Think about it, there are good reasons to use the USB spec for voltage. Not only is the voltage supplied through a USB socket, but it supplies USB sockets (at least one) without further regulation. I'll definitely give it a try as soon as I can acquire the necessary parts. I found a bunch of diodes in a stereo I pulled apart yesterday, have to check the numbers on them and see exactly what they are yet. I've always assumed the RPIs official input requirement to follow the USB spec, 5v +-0.25. I do not remember seeing anything official. I have tested several RPi versions at lower voltages and most seem to work all the way down to 3.5v, likely due to the 3.3v regulator. This is all assuming you have nothing on the USB ports or they are tolerant of this lower voltage. Some of my USB WIFI adapters seem to be fine down to 4.0v, some stuff doesn't like 4.5v, it's a mixed bag. Unless you are experimenting, stick to the specs. Never worked with the MP2636, but it does have a fairly complete datasheet. FYI: Load transients on the output are around the 500mV level, granted at a couple of amps, something to keep in mind. Your wiring at 13awg seems a bit overkill, but that should be ok assuming you don't start pulling copper pads off of PC boards. The quality of your input power would also be one of my questions, maybe it doesn't have good load regulation itself. Can you try another input power source? Since this looks a hobby project, I wouldn't worry too much about an occasional lightning bolt, as long as your whole setup works reliably. I would try various capacitors directly on the GPIO 5v pins, see what that does. I might have missed it, but I would also look into where in the Pi you are feeding power. For instance if you are daisy chaining the power from a display and through other connectors, I would give that a quick look. If this was a commercial project your setup should be on a scope so we can see exactly what is going on.. but hey, hobby Pi, bonus points for having a scope to see transients, but not required, swap components till something works! I have also noticed that undervolt events trigger throttling. For my use, throttling must absolutely be avoided as a throttled Pi is incapable of performing the tasks I am asking of it. My use of 13AWG wire was really only because thats what I have. Its either that, or I could have used 11AWG or 8AWG. The GPIO header is inaccessible (see above photo) for putting a capacitor directly onto it. I do feed from the traces on the screen which run directly to the GPIO, but I could almost guarantee they're not a problem. Unfortunately, I do not have a scope, nor does anybody I know. The only tool I do have, is a digital multimeter my uncle gave me. Looking into this further.. I believe your power/charger board might have the charge current set to 2.5A. Using a 2.5A power supply with a 2.5A charge current might not work well. It must also power your Pi too right? The MP2636 is probably folding back the charge current but likely not before a momentary dip in voltage, which sounds like what you are seeing. Find the ISET resistor, likely 47.5k or thereabouts hanging off of pin 13 I believe, on your charger board and change it to 120k. That should reduce charge current to 1A. Test it again. You can solder a capacitor on the back of the GPIO pins if you are careful, or use one of the power input test points. I thought I read it somewhere - you know what it's like when there is no published specification, and that's why I labelled the RPi a "toy"* in another topic. I was assured there are design specifications to satisfy the professional market, but I have yet to find them and reading between the lines they may only apply to the Compute Module. It would help if we knew what tests are used to reject non-working units off the production line. If they are only run up at a nominal 5.1V supply, that's the only voltage they are guaranteed to operate at. The point is that the RPi's primary design goal is to be cheap. Extensive testing is expensive. If a manufacturer publishes a specification, they are taking responsibility that every part they supply to that spec meets it - which means they have to be damned sure their line testing can weed out any units which don't meet that spec (at least for a sample of each batch). If they publish a formal specification that the input voltage is 4.75-5.25V, they would have to verify it. Hence, I suspect, the lack of formal specifications. Yes, it makes sense that the 3.3V rail can be maintained from voltages lower than 5V (it depends what the drop-out voltage of the switching regulator is), but just because the USB spec says 5V±0.25V doesn't mean the RPi has to be capable of operating over that range. Even hobbyists need to have confidence in what they are doing. The last thing you want is to spend loads of time (and possibly money) coming up with a solution to some problem only to find that it doesn't then work in the winter or if you have to replace a component (such as the RPi itself). That's why specifications are so important, and the nearest we seem to be able to come to absolute specifications is data gathered by collective experience. * By which I mean operation is not guaranteed and all applications are at the user's own risk - therefore only suitable for non-critical situations such as hobby and education. Last edited by Z80 Refugee on Sun Jun 03, 2018 9:27 am, edited 1 time in total. Getting back to the OP's original problem, the cure was to shorten and beef up the cables from the power source. That then revealed a subsequent problem with the power source being unable to sustain peak load (it crosses my mind that winding the output voltage up actually makes the problem worse - more volts, less current capability, although that may be rendered immaterial by the switching regulator on the RPi). The sticking plaster solution to add capacitance to overcome short-term short-falls in supply capability introduced its own problem in the form of inrush current crippling start-up, so for me the only decent reliable answer is to beef up the supply so that even peak load can be supplied with a margin. Yes, I'm a retired electronics design engineer with military, automotive, and high-reliability systems experience. My career was somewhat different - TV outside broadcast. Unlike studio engineers, we had to solve problems on the fly, often without ready-made solutions available on the market. And it had to work reliably first time - we couldn't ask the horses to re-run the Epsom Derby. On the other hand, it probably wasn't going to be useful more than once, and wasn't going into production, because by next year's Derby a whole new generation of equipment would be available on the market, and the production team would want to stretch the possibilities in new directions. I can well understand your attitude - military and automotive systems demand more than a one-off solution, and medical systems take it one stage further. So before recommending my suggestion, you would have to do a lot more research, and your time would be better spent on improving the power supply. On the other hand, for a one-off, my idea still stands - though to make it work you'd have to work out the values of the cap and resistor (requiring measurement of what the regulator can supply, how long the dip in voltage lasts, how long between dips, etc.) and you'd have to look for an appropriate diode. Maybe there isn't one - I haven't looked, I'm leaving that to whoever's considering it - but if, as you say, there isn't one that cuts the mustard, we could consider an 'ideal diode' such as appeared in the Pi B+. That would solve the three issues you high-lighted - switch-on time, voltage drop, and current-carrying capacity, though at the expense of greater complexity. I think the only way I'm going to know exactly whats happening is if I can source a scope or at least an analog voltmeter since apparently my digital multimeter is useless - it reports a pretty steady voltage, never detecting any dips in supply voltage. I guess it isn't quick enough? I really appreciate all the very helpful discussion so far. I haven't done anything this weekend due to having visitors from New Zealand coming ~2PM today, but I'll try the latest suggestions when I can and report the results. Lowering the charge current of the battery was something I decided to try a little while ago but quickly concluded that was not the issue since I do not get any undervolt issues while using the Pi, only while switching from battery to external power or vice versa. I'll figure something out regarding the case, but practically nothing can be added to that side of the Pi. Thank you for the idea nonetheless. A digital multimeter averages the input over the sample period (typically a few tenths of a second), as a consequence of its measurement process. An analogue meter averages the input due to the low pass filter response of its mechanical nature. Neither will provide useful data for this kind of thing. A 'scope is a must for electronics enthusiasts; I chose a Hantek DSO5102P and bought via eBay, you could also look at the Pico range (they use your PC to do the display and controls). I would also like a logic analyser, but have yet to find anything sufficiently inexpensive with anywhere near the kind of capability I had access to at work. Any progress here? I will happily send you a couple of Schottky diodes to test, but now this forum does not allow PMs we have no means to exchange contact details in private. I use an Arduino UNO with a 256K FRAM attached to read and store analogue signals as quickly as possible. As I'm only messing about with +5V down to 0V, I just go direct into the Arduino UNO ADC input pin. I use a digital input pin on the UNO to trigger or leave it free running depending upon what I want to see. Once the data is captured, I trasnmit it serially to a PC where I can analyse it in EXCEL. Ah sorry! Had a very busy week and haven't done anything yet. As it so happens, the solder tab on my battery broke off so I need to order a new battery to proceed. While I was at it, I placed a 3A SFE4 fuse inline with the 5v. What I've found is that I get a stable 5.10v at Pins 2 and 6 while running from the battery, but issues arise while trying to use the official power supply. 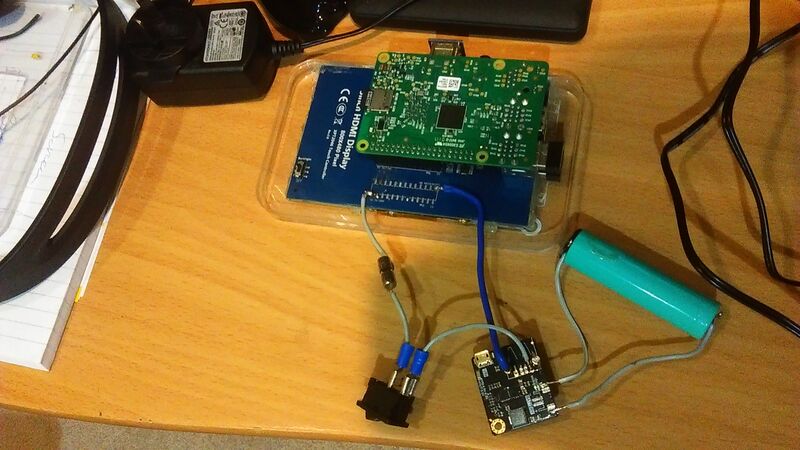 As soon as I turn the Raspberry Pi power supply on, I see the voltage drop to 4.78v. This shortly after climbs to around 4.9v, but the Pi still occasionally complains of low voltage. I've used a combination of 13AWG and 18AWG wiring and all parts are rated for more than 10A in this project, and it definitely works flawlessly when powering by the battery. I'll try to limit this to 0.5A or so, and see if that helps any..
For reference, heres an image showing the wiring. The gray wires are 18AWG, the blue wire is 13AWG and connected to ground. The datasheet mentions an Riset, would this be what you are referring to? Yes, Riset should be the Resistor for iset.. Resistor Current(i) set, sounds right. Indeed you are likely pulling more then your AC/DC power supply can manage, 1A to the Pi plus 2.5A for your charger = 3.5A. Likely greater then your supply, which is dropping in voltage when you plug everything in. If your charger IC didn't have that charge current fold back feature it would likely just brown out and reset/stop your Pi each time you plugged it in. Try it, I'm fairly confident it will fix your problem. Thanks for all the help so far, just want to confirm something before I go any further. In my box of electronic trinkets, I cannot find any 120kΩ resistors and stringing together a few to add up to ~120kΩ, would be quite the mess. According to this chart, I can set the charge current to 1A with 120kΩ, as you pointed out. I wanted to try and set it to ~0.5A however, but this value is not shown on the chart. Do you think it would be okay to place something around 180kΩ (chart appears to level off the higher the value gets, plus I have one of these), or should I stick to the values shown in the chart? There are two possibilities I see. The first is that the manufacturer knows it won't, or didn't do the engineering to determine if it would, work reliably so they did't include lower ICHG values in the chart. The other is that somewhere in the text specifications (ICHG minimum?) they say it can be set to a lower value but they decided that none of their target customers would want to do it so they shortened the chart for readability. 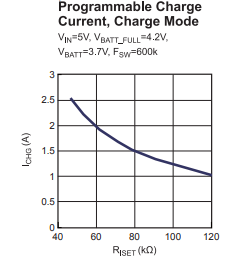 I don't see anything in the datasheet that gives a low limit on the charge current. That chart is under typical characteristics and as Paul mentioned in this second point.. they must stop the graph somewhere right? I would try anything between 0.25 to 1A for testing purposes. I'll double check the datasheet and then see if I can figure out how to remove the current resistor - its so tiny and close to other parts. I appreciate the help and patience. I think those are 0402 or 0603 resistors.. about the smallest most people can work with. It's mostly done under magnification. At that size removing them is easy; a big glob of solder on your iron, enough to where it covers both leads, will usually pull them right off the board. Putting them back is a bit more of a delicate job. Note: the other end of that resistor appears to be going to ground.. so if you are using a leaded resistor for testing you should have plenty of ground points to use other then the small resistor pad. Do you think it would be okay to place something around 180kΩ (chart appears to level off the higher the value gets, plus I have one of these), or should I stick to the values shown in the chart? It's hard to say how the plot extrapolates, it could go either way (increase or decrease the slope). However, if I had to guess I would say the law is I = 120,000 x ( 1/R ), so if you want 0.5A you would need 240kohm. Anyway, I managed to easily replace the resistor and checked to make sure I had not accidentally shorted anything (seriously, its TINY) before reconnecting the battery and powering it on. The situation is terrible now. When running off the battery alone, the system goes into a boot loop, only reaching as far as the rainbow screen. This strikes me as odd, since previously the battery used to work perfectly, even while under extreme stress testing. Once I plug in the official power supply, I get the system to boot, but there is a constant undervolt situation, and I measure exactly 4.75v at the GPIO. I guess its time to concede, I'll just have to put it back how it was and recharge it only while not using it. Not ideal, but its close enough, I guess. Oh, and my 18.5WH battery turned up today, so I guess its time to just finish this project and call it done. Thanks for all the guidance and help along the way! Not satisfied with how this ended up, I've ordered a DSO138 oscilloscope from a dodgy Chinese company I've never heard of. I'm kind of sceptical about how accurate it will be, but will have to see once it arrives. I accidentally destroyed my last MP2636 but I have two more that I can experiment with. Funny story, kind of... After finding the resistor to not work as desired, I decided to desolder it and try a different value as was suggested, but silly me forgot to remove the battery first. As soon as I lifted one leg of the resistor, I guess the full current of the Lipo I had connected went through the IC and it began to glow orange and smoke quite rapidly. I must say, unlike the Raspberry Pi, the smoke wasn't blue, but rather white. Maybe that was my problem, it lacked the magic blue smoke. Anyway, while I wait for it to arrive, I was wondering if anyone had any concerns or advice regarding using the oscilloscope. Yes! Do remember that for most bench type scopes the ground connector (outer barrel) on your BNC probe is actually GROUND, like from the building! Trying to measure voltages referenced to this ground (like the AC mains line) can be dangerous to you and your scope. On occasion I test this and trust me the building always wins!